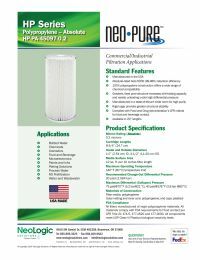 Neo-Pure HP-PA Series High Purity Polypropylene Filter Cartridges are manufactured in state-of-the-art white rooms and constructed out of 100% polypropylene. HP-PA Series Cartridges offer a wide range of chemical compatibility and can be used in a variety of applications. All HP-PA cartridges comply with FDA criteria for food and beverage contact and are manufactured in the USA.